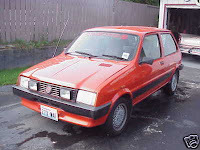 1982 MG Metro - I have no idea how many MG Metros there are in the US. This may be the only one. I've never been to England, but it's on my "to do" list. (I need to find someone to go with. Someone who won't mind me stopping to look at every car on the street, but who will be able to snap me into reality by saying, "NO, YOU CANNOT BUY THAT CAR AND BRING IT HOME!" They will need be convincing and they will probably have to repeat it a dozen times a day or more.) What I know about the Metro comes from reading about it in UK car magazines and online. I've never seen one. From what I can gather it's a pretty polarizing car. Some people love it and others hate it. Whether the Metro is a good car or a bad car doesn't matter in this case. Here in the US it is so unusual that you'd buy it just to have it and show it. It's guaranteed to draw a crowd. This car has been on and off eBay and Craigslist for quite some time. I don't think the condition of the car has anything to do with it not selling. It just takes time to find someone who wants and appreciates a car like this. 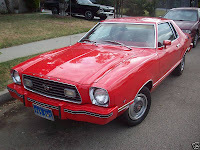 1977 Ford Mustang II - Writing about the Metro reminded me of an ex-girlfriend who lived in England for a little while. (She would have no problem saying "NO!" to any car I wanted to buy - In the UK or here in the US.) She didn't get her driver's license until age 28, but as soon as she did she went out and bought a very used V8 Ford Mustang II. Eight years later, when I met her, she still had the thing. I drove it a few times. It scared the hell out of me. The handling was awful. I shouldn't base my opinion of the Mustang II on the one I drove. It had at least 168,000 miles on it by then (the odometer stopped working a year or so before) and automobile maintenance was not a priority in my girlfriend's world. Despite the high mileage, the emissions strangled engine and the lack of maintenance, her V8 Mustang II was relatively fast and, to its credit, never failed to start or left her stranded. The Mustang II, which received less than stellar press reviews when introduced, sold well. There are few left, however. The 4 and 6 cylinder cars were usually scrapped. The V8s usually wound up in the hands of kids (or ex-girlfriends) who abused the hell out of them. A nice, clean V8 Mustang II is a rare find these days. The car on eBay is a nice clean V8 Mustang II. It's also the Mustang II I would buy if I ever developed an urge to own one. With it's notchback roof and lack of "go faster" add-ons like the "Cobra" version of the Mustang II had, it's a sleeper. It's not as fast and doesn't have the "muscle car prestige" (or the price tag) of the earlier Mustangs, but in a straight line race you'll surprise a few people driving better known cars. 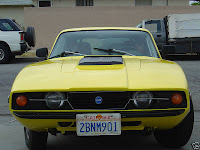 1972 Saab Sonett - Back in March I wrote a post about a Saab Sonett. Based on the e-mails I've gotten, it was one of the more popular posts. Here's another very nice Sonett. The eBay listing includes a lot of clear photos. Click here to see it. I also stumbled upon 2 Saab enthusiast websites I hadn't see before. I think they're from the same person. Neither look like they've been updated in awhile, but there's still some good pictures and, if you explore the links, some nice information. Click here to see "Saab Site #1" (That's not its name - I don't know what else to call it). Click here to see "Jeff's Home for Orphaned Sonetts"
Come to England any time you want. We'll put you up and let you drive our Metro! Great blog! I just found out about your blog but will be following it; I'm working my way through the archives. Great work-- thanks!